- Looking for the perfect Ramekin Set to complement your cooking & serving collection? - You want to bring that wow factor to your cooking and presentation? - If you love making and serving delicious foods and want to take it to the next level, then search no further! What you need is KitchenBasix Ramekin Set! - These premium quality ramekins are designed to cater to all your cooking, baking and serving needs. The heavy duty, glazed porcelain moves easily from oven to microwave to freezer without a hitch. 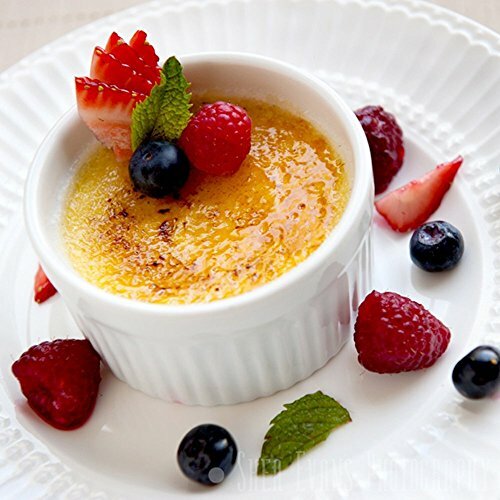 - KitchenBasix Ramekins, the best of its kind, are developed after extensive research and development by a team of experts, and tested by professionals. These ramekins won't absorb any odors, flavors or colors and will look new after every use! - Cleaning and maintaining KitchenBasix Ramekins is simple. It is dishwasher safe. - The gift-box packaging also make these ideal gifts for house parties and other occasions while the neutral colors are sure to suite the décor of any home! - 100% full one year, money-back guarantee! If you are not satisfied with the product, get your money back! - Since there is zero risk, click on Add to Cart Now to bring these ramekins to your home and also enjoy the amazing discounted price while stocks last! BEST RAMEKINS AT THE MOST AFFORDABLE PRICE - KitchenBasix Set of 6 Ramekins with capacity of 4.5 oz each are ideal for serving condiments, dips, salsas, dressings, sauces, appetizers, and side dishes like olives and bruschetta. SOLID CONSTRUCTION TO DO IT ALL - The heavy duty, glazed porcelain moves easily from oven to microwave to freezer without a hitch. You can use these to prepare hot or cold dishes. To add to that, these are dishwasher safe so clean-up is a breeze! ELEGANT DESIGN - These beautiful white ramekins will complement any table setting highlighting the food being served. Delight your guests by serving savory or sweet dishes in these ramekins prepared just for them! You can cook and serve food in these without worrying about chips, nicks, cracks and scratches. COMMERCIAL GRADE MATERIAL - These ramekins won't absorb any odors, flavors or colors and will look new after every use! You don't have to worry about harmful toxins leaching into your food after multiple uses. 100% FULL ONE-YEAR WARRANTY! If you are unsatisfied with the product, get your money back! Since this is a risk-free purchase, go ahead and CLICK ON ADD TO CART NOW to bring these ramekins to your home. These neutral colored ramekins come in gift-box packaging so they also make ideal gifts for your loved ones!